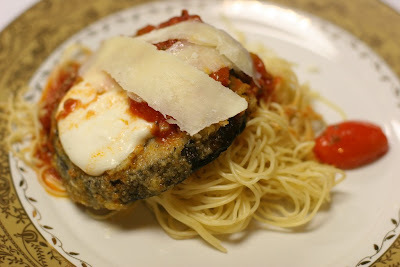 I prepared this Eggplant Parmesan at my Farmers Market Workshop and Cooking Class at A Thyme for Everything. To see all of the photos and recipes, click here! Photos are courtesy of Andrew Doak. 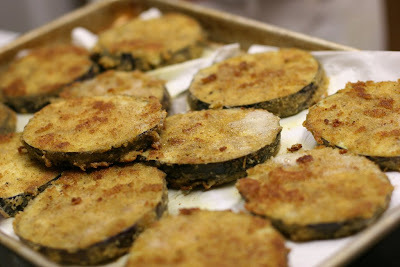 Coat the eggplant in flour, then dip into an egg, then into bread crumbs, parmesan, salt and pepper. 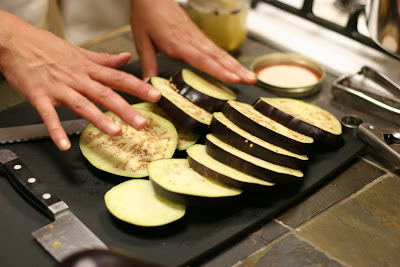 Heat butter and olive oil in a large saute pan and cook eggplant for 1 to 2 minutes on each side, until cooked through. Download the recipe card here. Be My Hero... to Animals! New Blog Announcement... It is official!